October | 2006 | Planet Geek test site. What is it about New Jersey? Here I am, back again, this time for more than just visiting a client. It’s been almost a week since I’ve been home, and it begins to wear. But enough of the that, let’s see what’s been going on. First of all, there was Ubercon. This is the 8th event I’ve done for them, starting with our snowbound adventures in the beginning of 2003. Many of the original folks who were at that event still come to the con, both as staff and as attendees. It’s settled into a close community of gamers, focusing on what they love most – Gaming. Sure there’s the smattering of costuming, artists, and movies, but the vast majority of the people there are there to play games. Board games, card games, miniatures, LAN games… 24 hrs a day for 3 days, gaming gaming gaming. Ubercon was the first place I ever played Settlers of Catan and Icehouse, was my first exposure to Unreal Tournament, and was the place I first saw Guitar Hero. All in all the event went fine. With help from blk, we worked all the hours necessary, got at least one nice dinner out, and generally had an enjoyable time. Once again the Myth box was on prominent display, and many games of DigDug, Contra and SmashTV were played. I think there’s a future in making the machine easier to work with – console buttons for coin drops, player starts, and an easier selection mechanism. I would have liked to have left the machine alone and had people come up to play it more often, but alas, it was too prone to twitchy behavior and random joystick resets. What’s that you say? Pizza? Boston has plenty of pizza! What’s your problem? Hah, I say. Boston has a mere shadow of proper cheesey goodness. NJ is home to the thin-crust style pizza. None of the heavy crust, grease laden horrors that populate the Beantown. Here, any pizzaria has decent thincrust pizza. I frequent my favorite spot every day for lunch, trying to get my fill. In my youth, when I lived in Trenton, a certain pizzaria saw me every day or every other day for dinner. I was quite the regular, and gained a reputation for ‘4 slices!’ – after which I’d happily park myself in a booth and read half a book in the space of 2 hours. Such was my social life. Oddly, when I brought up my pizza fascination with one of the fellows at my clients’ office, he pointed out that Boston does indeed have a source of thincrust pizza. Papa Gino’s. In the interest of full disclosure, I do in fact eat there on occasion, but sadly, it can’t compete with small-shop pizza in the garden state. Only recently did I find out this chain is more widespread than I had realized. Around 1993 I found a Fuddruckers near Edison when I was working for Unipress Software as a sysadmin. We’d make regular forays out for half pound ground beef burgers. Not sure exactly what made them so tasty, but they were sure good eatins. This trip I scheduled my drive from Ubercon down to Princeton to give me time to stop by that particularly restaurant on Route 1, and it was as tasty as I remember it. Delish. The great DunkinDonuts epidemic hasn’t quite reached New Jersey yet. This has thrown off much of my morning routine, as given any opportunity, I’ll happily get a DD coffee and a bagel for breakfast (or lunch, or dinner, or a snack or…). In Boston, DDs are like mileposts. You can actually navigate by them (“Yeah, go down 3 DD’s, turn right, up 4 DD’s, and we’re on the left.”) Here? Not so much. I’ve found only one within a 10 mile radius of my hotel, and alas, it’s on the opposite side of the office. Sad. New Jersey is a study in contrasts in many ways. Noting that I did in fact grow up here, my view of the state has always been somewhat bucolic. I grew up on a horse farm in a very rural area. Cows, horses, etc were the normal views, and getting around on trailbikes and snowmobiles was the norm. We could wander for miles in streams and woods exploring in any direction, just avoiding houses every once in a while. The first leg of this trip was spent in Secaucus, near Giants Stadium. There are fewer places displaying a harsher contrast against the locale of my youth than Secaucus. Perhaps Elizabeth (those who are familiar with the area will know Elizabeth by it’s high refinery – to – human ratio). After 4 days there, coming down to the Princeton area was a rather dramatic change. Here in Princeton, fall is in full swing. It is cool, breezy, the leaves are bright yellows and oranges, and there’s just a hint of winter coming. Such a contrast to the industrial squalor of Secaucus. My arrangements in the Princeton area are usually set up for the Chauncey Conference Center, part of the Educational Testing Service, or ETS. I’m sure not a few readers frowned at the mention of ETS, as this company is the originator of the SATs, the bane of many a high school college-student-hopeful. At the moment, I’m sitting in the Chauncey Conference Center lounge, in front of a lovely fire in a natural stone fireplace, in a large comfortable leather chair. Over the fireplace is a portrait of man in his early 60s, holding a pipe, with a loose, comfortable smile. This man is Henry Chauncey, the founder of ETS way back in the day. Why is this of note? When my family moved from Long Island to New Jersey when I was about 6, we rented a house in Ringoes, NJ, about 8 miles from here, for a little over a year. During that time, I got to be friends with our neighbor and his family. He had a daughter named Sarah who was just my age, and another daughter. His wife I remember only fleetingly – I know she died around that time from cancer, but I don’t know if it was during the time I was around. The fathers picture now is in front of me above the fireplace. I spent a lot of time in the Chauncey household – Sarah and I had a lot of fun playing and just enjoying having a friend right next door. Mr. Chauncey (as I knew him) was always kind and had a lovely rolling voice. My memories of him were of a quiet, gentle man with a strong voice and the omnipresent smell of pipesmoke. His office was the epitomal intellectual / businessman’s home office. Heavy panelling, books books books in floor to ceiling shelves, a huge desk with a fantastic leather chair behind it, and of course, his pipes. It’s odd now sitting in front of his painting, enjoying some of what he helped build. I kept in touch with his daughter Sarah off and on over the years, and as I understand it, Mr. Chauncey lived late into his 90s, still active and travelling around the world with his daughter. I understand he finally passed away sometime around 1995. Computer ads through the ages. This has been linked to from everywhere, everywhen, but here it is incase you’ve been under a tech-media rock for the last couple days. PCWorld has put together a great Youtube collection of television computer ads. Some are hysterical, some are pitiful, some are sad. I’m particularly mournful of the loss of the Apple Newton, one of the finest pieces of technology ever designed, IMNSHO. Catching up on a bunch of pictures I had logged in my camera, but not uploaded. This was Columbus Day in Natick, while Zach and I hung out at the park with Steph’s boys, Alex and Drew. 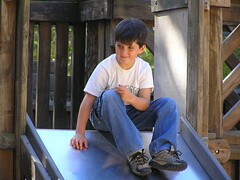 Zach had been playing on the slide with Alex, and stopped to watch for a moment. Click through for the entire set. I nudge about this occasionally, but here’s a quick reminder. I have an active team using the BOINC distributed computing system called the Stonekeep General Computing Facilities. It’s a conglomeration of a dozen or so users with a few dozen machines running BOINC. These machines run distributed tasks that range from searching for extraterrestrial signals to analyzing protein structures. Cumulative computation statistics from all the team members are collected by BOINCstats and displayed against other teams around the world. If you’d like to join, download the BOINC client and join one of the active projects (I recommend Seti@Home (Listen for alien signals!) or Folding@Home (Analyze protein folding to help understand various diseases), or Rosetta@Home, a similar protein analysis project). Do some good research -and- join a global project, and all you have to do is have a computer turned on. It’s that time of year again. Next week I’ll be heading down to Ubercon for our bi-yearly gaming geekfest. I’ve been doing this event from the beginning, and have had a ball every time. Lots of great gaming (card, board, and LAN), and great folks to hang out with. If you like tabletop gaming, LAN gaming, console gaming, or just geek-gaming-hangingout, this is the place to be. I credit Ubercon for getting me into DDR, Unreal Tournament, and Settlers. It was the first (and in reality only) place I’ve played Guitar Hero.